Microsoft launches Skype Bots preview for Android, iOS and Windows. Microsoft today launches Skype Bots-a new way to bring expertise, products, services and entertainment into your daily messaging on Skype. Microsoft also launched a new interaction on Skype-Skype Video Bots, taking a different approach to bringing useful and fun interactions into your video calling experiences. 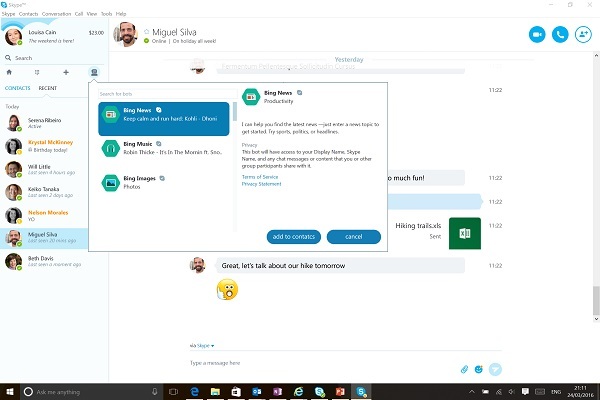 Preview Bots are available in the latest versions of Skype for Windows Desktop, Android, iPhone and iPad. Skype Bots will come to life through messaging today, and in the future will be available for audio and video calling as well. Each Bot will enhance your Skype experience in its own way, bringing a new dimension into your everyday Skype chats by helping turn your ideas and plans into actions. + A new Skype client, available on Windows, Android, iPhone and iPad brings the Skype Bot experience to all of Skype customers. + A preview of Skype Bots for you to experience and to provide us with feedback (currently available in Australia, Canada, England, Ireland, India, New Zealand, Singapore, and US).